I received a request for more behind the ice information regarding the Classic. In 1906, six gentlemen bet on the date the ice would go out on the Tanana River. The contest returned in 1917, when railroad engineers bet $801 on the date. The contest has been held every year since then, and has become an Alaskan tradition. The tripod, is technically a quad pod. It’s made out of local logs and weighs several hundred pounds. A trough is dug in the ice for the tripod base to sit in, then a hole is bored through to allow river water to fill the trough and freeze the base in place. Now things get really cool, but keep in mind the system was designed by railroad engineers in the early 1900’s. A cable is fastened to the tripod, and four ropes run from the cable to a tower on the shoreline. The main rope runs through a pulley system that connects to a barrel weighted with several hundred pounds of rocks at the base of the tower. 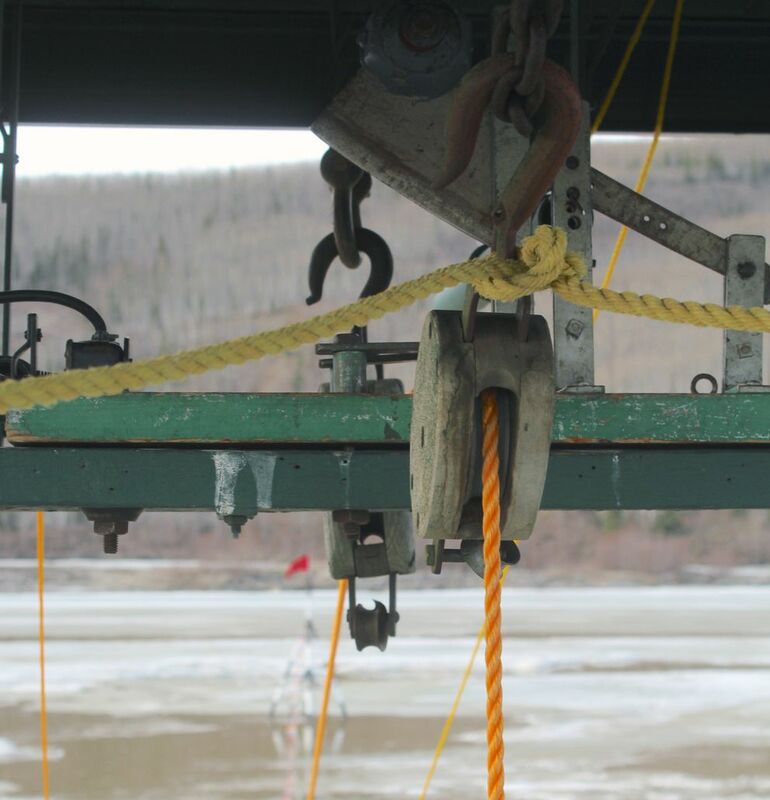 When the ice starts to move, this rope takes all of the stress and lifts the barrel of rocks several feet into the air. A second rope has a foot of slack. 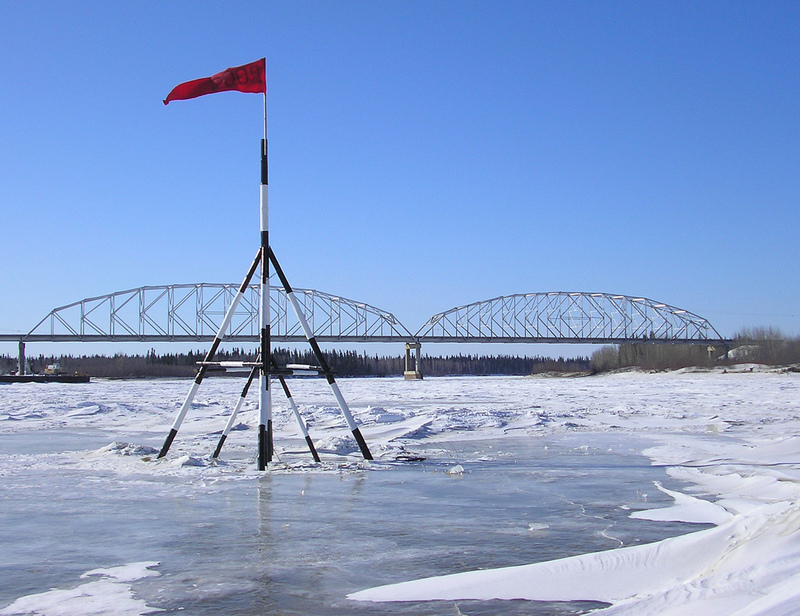 This one triggers a siren in the town of Nenana to signal that the ice has started to move. When the tripod moves 100 feet, the rope to “Eldridge” pulls a pin, the cleaver is released, cutting the main rope. The counterweight crashes to the ground, and the tripod is free to float down the river. 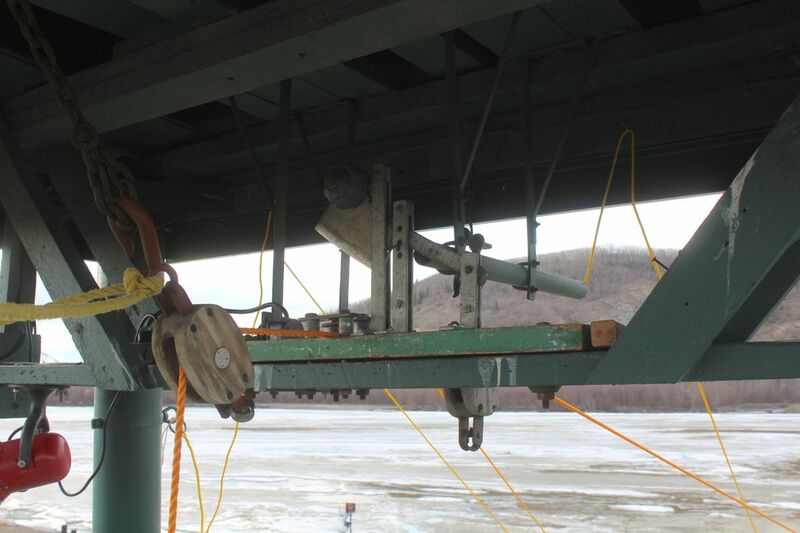 Once the main rope is cut, it falls pulling the final line, which is attached to a copper wire on the clock. The clock is then tripped, after the tripod moves 100 feet downstream, signifying the winning time. There are actually two mechanical clocks. 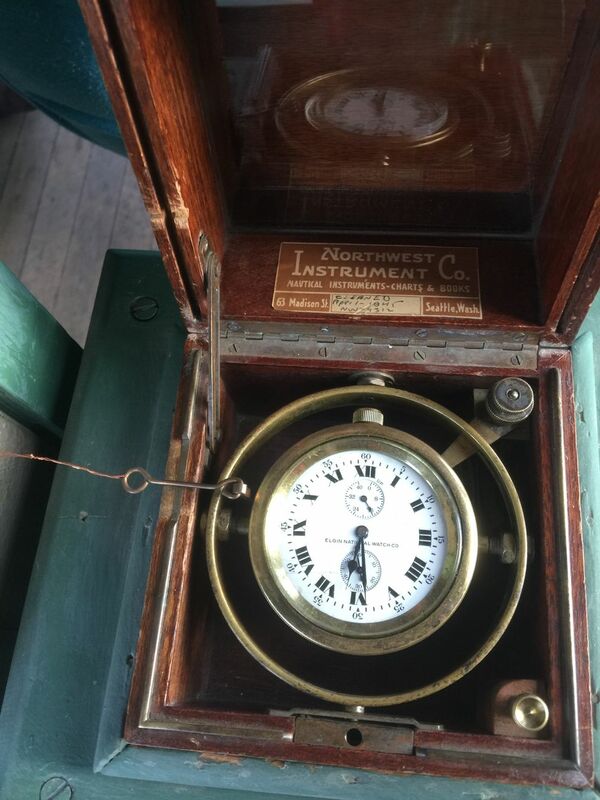 The one pictured here, which is a ship’s chronometer, was manufactured by the Elgin National Watch Company – which stopped making clocks in 1967 – needs to be wound once a day. The second, back up clock, needs to be wound only once every eight days. This entry was posted on Monday, February 4th, 2019 at 7:07 AM	and tagged with history, nenana ice classic, photo, tanana river, travel and posted in Alaska. You can follow any responses to this entry through the RSS 2.0 feed. Thanks for the greatly detailed info and photos. That’s a very unique and historic system used to determine when the ice goes out. Where are the two clocks located ?? If at or near the tri (quad ) pod I would not want the daily job of winding the Elgin built clock. Oops– just reread your info and I believe the clocks are on the shore. Both clocks are located in the tower on shore.